special for you to offer this upcoming SPRING 2019. Our Berber Rafting team will meet you at the Marrakech airport and take you to your accommodation. After only 15 min drive to the old town, the "Medina", we reach the place Jamaa El Fnah. This is where your adventure starts. You will walk through the "souks", a mind-blowing maze with spices, shops etc... After a welcoming mint tea we head outside to discover the night life at the Jamaa EL Fna Plaza and try the fantastic local cooked freshly food. At the end of the evening you enjoy the view of the High Atlas from the rooftop of the Riad (Maroccan traditional house). Today we'll be trekking with mules in the Hidden Atlas with our local guide Momo. After breakfast start by going up the infamous Cathedral rock. 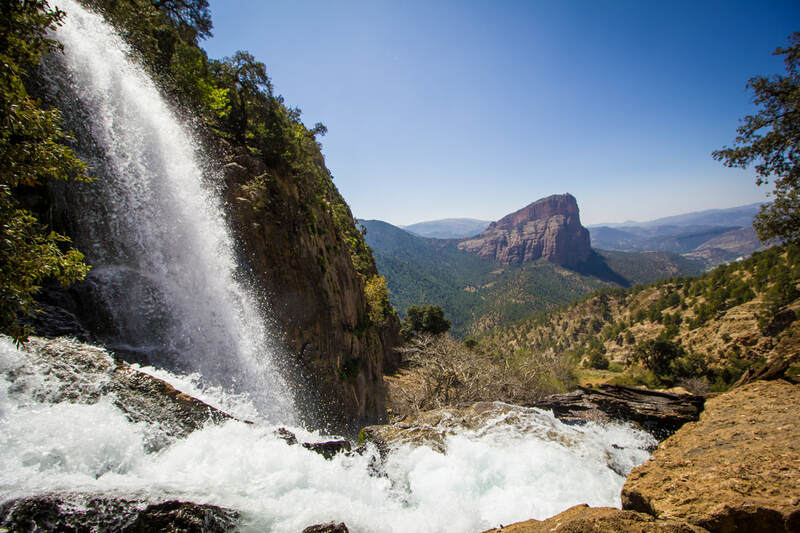 It's Morocco's most steep rock which allows people to to base jumping, paragliding and wing suit. After lunch we head back down through the cascade of Warouden. Here you can taste the most clean water of the area from its source. We might even see some monkeys hiding in the trees. Tonight we will sleep in a berber house with a local family or in the tent in front of Cathedral (Tamga village). Today we visit a local village "Tamga". 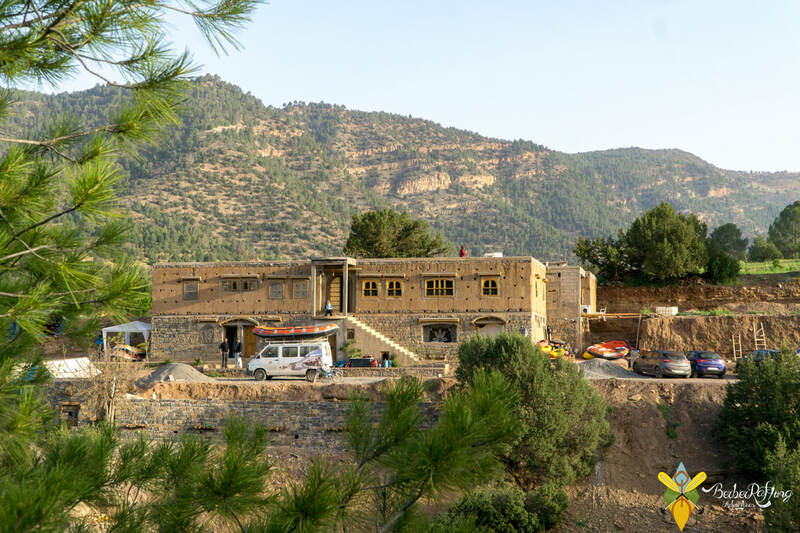 It's one of the most ancient village that is still habitable by local Amazighs people. You will be touched by their hospitality and kindness and yet very poor. 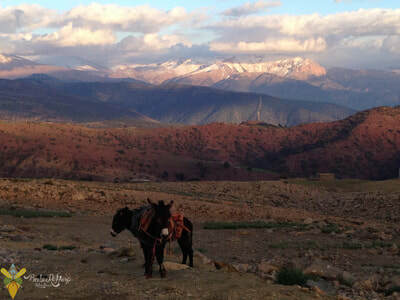 We will then be trekking with mules through the Hidden Atlas and experience the nomadic lifestyle. After a long day of walking we'll spend the night in a Gite in a village called Anergui. Today its white water rafting day. Our put in is from an ancient village called Anergui. 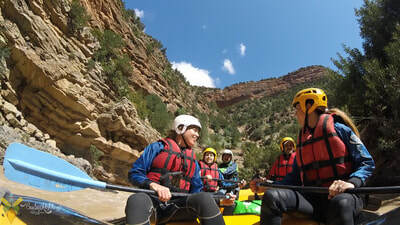 After safety instructions we practice and float down rapids all day (class3) through Morocco's little Colorado river. The route is dotted with rapids crossing an Aleppo pine forest landscape. In a magnificent setting of beautiful red gorges, the Assif Melloul or in Tamazigh "white river" allows you an easy, enjoyable rafting trip. To help you get the most out of your trip, guides are available to give instructions and guidance on navigation. At the end of the day we reach Momo's Gîte. 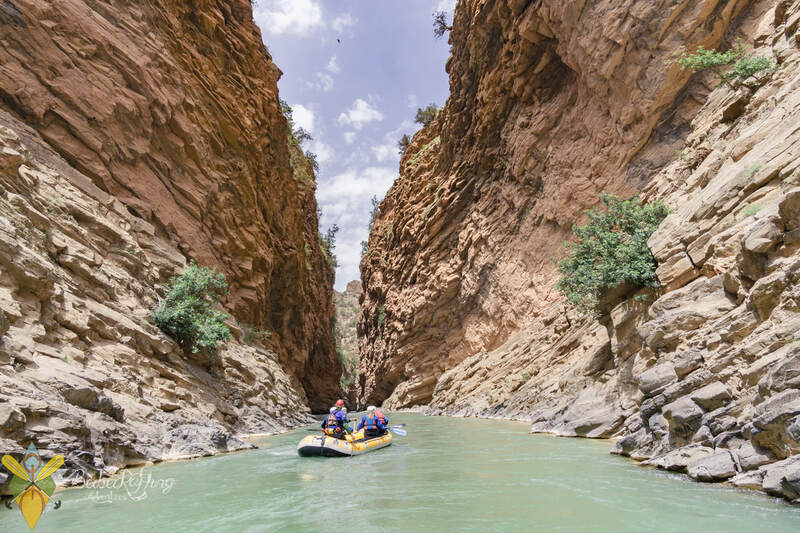 After lunch we paddle down the Ahansal River "Morocco's Grand Canyon" (class3/4). After the biggest rapid (class4) we reach our river campsite where our local team are hosting us with a fresh mint tea. While we are sitting by the fire enjoying the magical surrounding our cooks are preparing a nice meal for the evening. 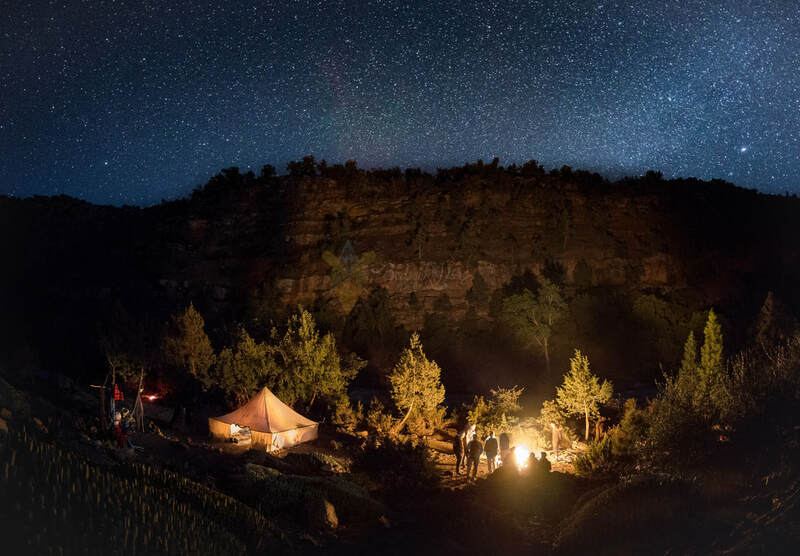 You will sleep under stars like you've never seen before. Nothing better than waking up with a fresh air and morning sunlight by the river. 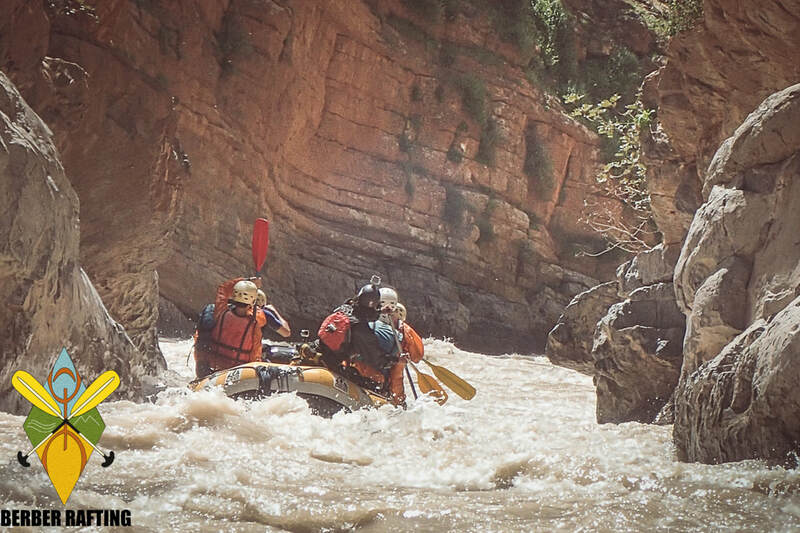 Today we'll paddle a couple of exciting rapids (class3/4) and float down for 3 hours through Morocco's "Grand Canyon" carving this magnificent red gorge with blue, green magical water (class 2). 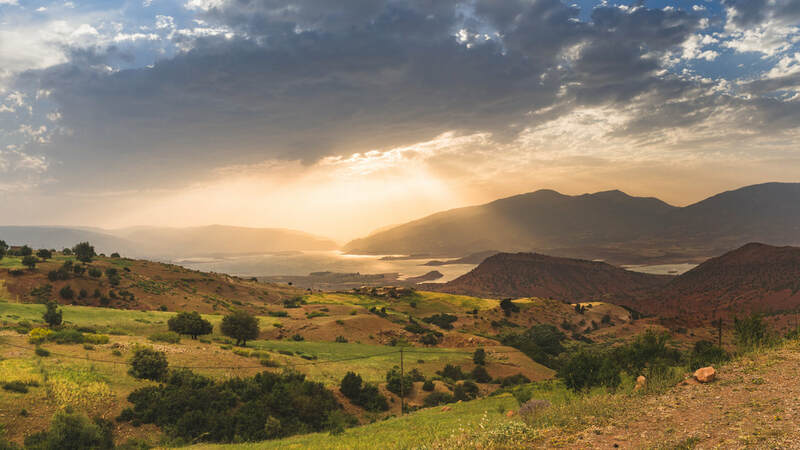 We will have lunch on a fishing boat while crossing the spectacular lake El Bin Ouidane. After packing up we drive back to Marrakesh.